Manchester City’s evisceration of Manchester United on Sunday was orchestrated by foreign stars, with the six goals split between imports Mario Balotelli, Sergio Aguero, David Silva and Edin Dzeko. It’s not unusual these days for Premier League sides to be full of international players from all corners of the world. But it wasn’t always this way. Foreign professionals were banned from the English game between 1931 and 1978 by an insular – and at times, xenophobic – Football Association. English football’s institutions were stuffy, arrogant – and scared of foreigners. In that period, the only foreign imports who were allowed to play in the main divisions were amateurs (for no pay), refugees, some applicants with Commonwealth ties, prisoners of war under certain conditions or others like POWs who became naturalised by residency after two years working in a non-football environment. Such little-Englander isolationism was a blot on a nation’s football landscape. It coloured and diminished the English game for decades, arguably denying England access to innovation and more sophisticated techniques – and has had knock-on effects still being felt. But that’s a different discussion for a different day. The subject du jour is City’s long, glorious history of imported talent, and it is a history that includes some of the most significant overseas players ever to feature in the English game. Before we consider five of those players – including the first foreign player to appear in the English Football League, at the back end of the 19th century, and the most prolific foreign goal scorer ever – here are some statistics about City’s foreign legions down the years. Since the start of the Football League in September 1888 until the Manchester derby on Sunday, City have used 108 foreign players (non-British and non-Irish) in league games, the vast majority of them in the Premier League era since 1992-93. 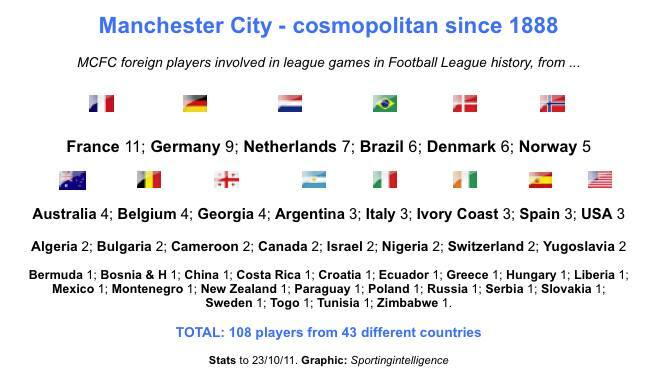 This puts City among the top handful of clubs using foreign talent in England, ever. On top of the 108 foreign players in league matches to date, City have used another eight foreign players only in major cup competitions, to date, also listed at the bottom, while they’ve used a further nine players born on foreign soil who are essentially British. City’s owners are not British, of course. Sheikh Mansour comes from a petrodollar trillionaire family from Abu Dhabi. But he is far from the first significant foreign influence at City, which has embraced newcomers with a tolerance and warmth not always notable in English football. Here are five imports who’ve helped to make history at City. Walter Bowman, a Canadian international who was born in Waterloo, Ontario, in August 1870, was the first foreign player to appear in an English football league match. He did so for Accrington, in January 1892, and later moved to City, who were then still known as Ardwick. Ardwick went bankrupt while Bowman was with them, and they emerged as Manchester City. Bowman’s debut for the club was a 3-1 win over Crewe in February 1893. He scored a rare goal in that game. Bowman had first come to England on a football mission with a touring Canada international side in 1888. 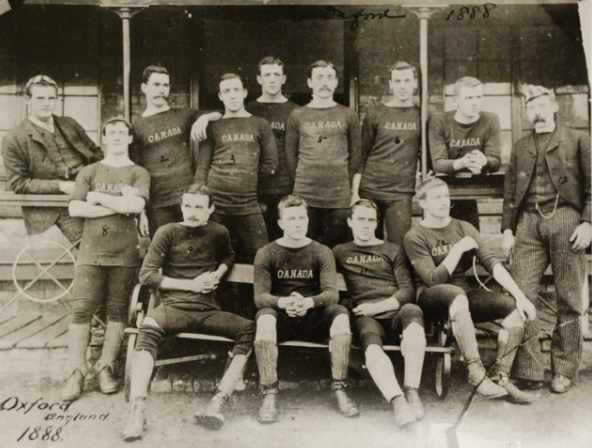 That team is pictured left (click to enlarge), and Bowman is in the back row, fourth from left of those standing, with the number 3 penned on his chest. He was a defender who played 47 first-team league games for Ardwick / City over seven years. He was evidently a decent player; team-mates during his time included the Welsh ‘Wizard of the Wing’, Billy Meredith, and later Jimmy Ross, who had been a Preston ‘Invincible’ in 1888-89. I identified Bowman as the first foreigner in English football league history while researching a history of foreign footballers, first published in 2003. To give a brief taste of how exotic that 1888 Canada team seemed, here is a snippet from the ‘Sporting Intelligence’ section (the sports pages) of a contemporary newspaper. 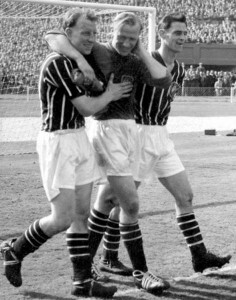 There can be few if any City fans who don’t already know the story of their legendary, long-serving former Nazi goalkeeper, Bert Trautmann. But for those not familiar with his story, which surely begs a movie, here’s a brief summary. He was born in Bremen in 1923 and like most German boys of the era was inducted into the Hitler Youth as a young lad. He became a paratrooper, endured all manner of trauma in the Second World War, and ended up being captured by the British. He was brought to England, classified a Nazi because of his background and spent years in various POW camps, first in Kempton and later in Ashton-in-Makerfield in Lancashire, where he forged his role of goalkeeper. He joined St Helens FC, and then in 1949, amid a massive storm of controversy, signed for City. The context needs highlighting. City stood their ground and signed their man, who had come to love and be adored his new community. Ultimately, humanity prevailed. Trautmann was no more responsible for Hitler than the fans who turned up in the thousands at Maine Road to adore him. He played more than 500 league games for City in 15 years. Famously he broke his neck during the 1956 FA Cup final (won by City against Birmingham ) – and played on! (Photo of him coming off at the end, right). In 1956 he also became the first foreign player to win the Footballer of the Year award. Time and space limits the amount of detail here about Trautmann’s utterly extraordinary life, including being the first sportsman in Britain to wear Adidas, being manager at Stockport and of several countries, and being special ambassador to Germany’s 1966 World Cup team. But it was a pleasure and privilege to interview Trautmann, now 88, several times for my book. It’s hard to believe in these days of foreign owned and foreign staffed clubs that foreign professionals were banned until as recently as 1978. The exoticism of Ossie Ardiles and Ricky Villa arriving at Spurs on the back of winning the World Cup cannot be overstated. 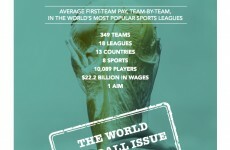 This was major news at a time when sport rarely made the news pages. Oh what heady days they were. 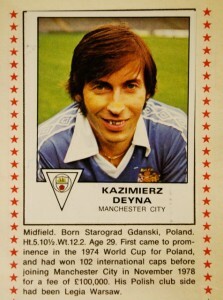 For reasons far too complex to dwell on here (European law, essentially), the barrier to foreigners came down that summer, and one of the most intriguing imports among the 1978-79 wave was Kazimierz Deyna. The cultured Pole moved from Legia Warsaw to City in a move influenced and smoothed by BBC commentator Barry Davies, football writer John Roberts, a Polish catering manager at City, and various club and army officials in two countries. For a more in-depth read about how the transfer fee for Poland’s World Cup captain included a photocopier, some medical tools and some dollars, read the brilliantly insightful piece linked here about a different era by John Roberts. Feed him and he’ll score. That was the mantra. 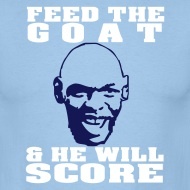 Surely no City fan needs an introduction to the Goat? His first professional club was Manchester United but it was at City he became a legend. I single him out among City’s foreigners because he remains, for now, the all-time highest foreign goal scorer ever to play league football in England. Between 1989 and 2006 he played for Rotherham, Notts County, Bristol City, Manchester City, Reading, Coventry and Southend, scoring 217 league goals in 552 league appearances (with 101 league goals for City in 184 games). For all his clubs combined he played a further 106 first-team games in cups, scoring 41 goals. His overall strike rate was 0.39 goals per game across 17 years. (NB: The only other foreign-born player to score more league goals in England was Gordon Hodgson, born and raised in South Africa, although he later played for England. He scored 304 goals for Liverpool, Villa and Leeds in the 1920s and 1930s, including 231 league goals for Liverpool alone, including 17 hat-tricks, a record). 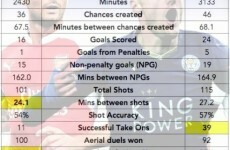 Representative of the Blue Moon Rising era, in which team-mates David Silva and Sergio Aguero are among others shining. The Italian’s problems have been well documented. But he is capable of genius on a football field. His manager, Roberto Mancini, rates him among the best five players in the world. We’ll see. But he’s certainly not short of ground-breaking predecessors. The lists of every foreign player in Manchester City’s history are at the bottom of this piece. 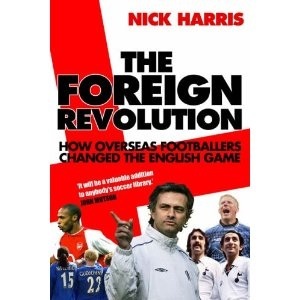 Nick Harris is the author of ‘England, Their England’ – a definitive history of foreign footballers since 1888 (published in 2003), and ‘The Foreign Revolution’, (2006) which is an updated and extended version of the same material. He wouldn’t urge you to buy either, because the story has evolved apace even in five years since TFR, but both books are available via Amazon sellers from 1p. If you do want to read more, though, on some absolutely astonishing foreign players, especially pre-Premier League, 1p could be decent value. Walter Bowman (Can); Bert Trautmann (Ger); Gerry Baker (USA); Kazimierz Deyna (Pol); Dragoslav Stepanović (Yug); Åge Hareide (Nor); Ivan Golac (Yug); Danny Hoekman (Neth); Michel Vonk (Neth); Kåre Ingebrigtsen (Nor); Alfons Groenendijk (Neth); Steffen Karl (Ger); Uwe Rösler (Ger); Maurizio Gaudino (Ger); Eike Immel (Ger); Georgi Kinkladze (Geor); Ronnie Ekelund (Den); Michael Frontzeck (Ger); Mikhail Kavelashvili (Geor); Giuseppe Mazzarelli (Swit); Gerard Wiekens (Neth); Jason van Blerk (Aus); Murtaz Shelia (Geor); Kakhaber Tskhadadze; (Geor) Shaun Goater (Ber); Danny Tiatto (Aus); Danny Allsopp (Aus); Chris Killen (NZ); Terry Dunfield (Can); Dickson Etuhu (Nig); Alf-Inge Haaland (Nor); Paulo Wanchope (CRica); George Weah (Lib); Laurent Charvet (Fr); Andrei Kanchelskis (Rus); Egil Østenstad (Nor); Eyal Berkovic (Isr); Simon Colosimo (Aus); Ali Benarbia (Alg); Lucien Mettomo (Cam); Christian Negouai (Fr); Niclas Jensen (Den); Alioune Touré (Fr); Sun Jihai (Chn); Kevin Ellegaard (Den); Nicolas Anelka (Fr); Sylvain Distin (Fr); Marc-Vivien Foé (Cam); Peter Schmeichel (Den); Mikkel Bischoff (Den); Djamel Belmadi (Alg); David Sommeil (Fr); Michael Tarnat (Ger); Paul Bosvelt (Neth); Claudio Reyna (USA); Antoine Sibierski (Fr); Daniel Van Buyten (Bel); Kiki Musampa (Neth); Albert Riera (Sp);Georgios Samaras (Grk); Ousmane Dabo (Fr); Dietmar Hamann (Ger); Bernardo Corradi (It); Hatem Trabelsi (Tun); Andreas Isaksson (Swe); Émile Mpenza (Bel); DaMarcus Beasley (USA); Rolando Bianchi (It); Gelson Fernandes (Swit); Geovanni (Bra); Martin Petrov (Bul); Vedran Ćorluka (Cro); Elano (Bra); Javier Garrido (Sp); Valeri Bojinov (Bul); Felipe Caicedo (Ecu); Benjani Mwaruwari (Zim); Nery Castillo (Mex); Kasper Schmeichel (Den); Jô (Bra); Tal Ben Haim (Isr); Vincent Kompany (Bel); Pablo Zabaleta (Arg); Gláuber (Bra); Robinho (Bra); Nigel de Jong (Neth); Vladimír Weiss (Svk); Roque Santa Cruz (Par); Carlos Tévez (Arg); Emmanuel Adebayor (Tog); Kolo Touré (IvCo); Sylvinho (Bra); Patrick Vieira (Fr); Márton Fülöp (Hun); Dedryck Boyata (Bel); Abdisalam Ibrahim (Nor); Gunnar Nielsen (Nor); Jérôme Boateng (Ger); Yaya Touré (IvCo); David Silva (Sp); Aleksandar Kolarov (Ser); Mario Balotelli (It); Edin Džeko (Bos); Abdul Razak (IvCo); Gaël Clichy (Fr); Stefan Savić (Mont); Sergio Agüero (Arg); Samir Nasri (Fr). Ronald Waterreus (Neth); Árni Arason (Ice); Hussein Yasser (Qat); Djamel Abdoun (Fr); John Guidetti (Swe); Costel Pantilimon (Rom); Karim Rekik (Neth); Luca Scapuzzi (It). Les McDowall (born in India, Scottish, also City’s manager in the ‘Revie Plan’ era); Colin Viljoen (born in SA, English); Tony Cunningham (born in Jamaica, English); David Phillips (born in Germany, Welsh); David Oldfield (born in Australia, English); Steve Lomas (born in Germany, N Irish); Jim Whitley (born in Zambia, N Irish); Jeff Whitley (born in Zambia, N Irish); Nedum Onuoha (born in Nigeria, England U-21 player). If tennis players were sports teams, Nadal is Real Madrid, Federer is Magic, Murray is Celtics and Wozniacki is Kings XI Punjab ….